We are so glad to introduce you a new vape kit, Wismec CB-60 With AMOR NS full kit. The Wismec CB-60 full kit is the first designed for high Nicotine and Nic-salts vaper by Jake Barney. Powered by 2300mAh build-in battery, it can reach a maximum output of 60W. With 2A quick charge, the CB-60 battery can be fully charge quickly. With 0.91 inch OLED screen to show you the information, and it also features Temperature Protection and Dual Circuit Protection. The CB-60 full kit comes with a 2ml AMOR NS Tank. Coming with the brand-new WS03 1.5ohm coil head, the AMOR NS Tank is designed for mouth-to-lung vape. It features detachable structure, top filling and bottom airflow control, all these make it convenient to use. 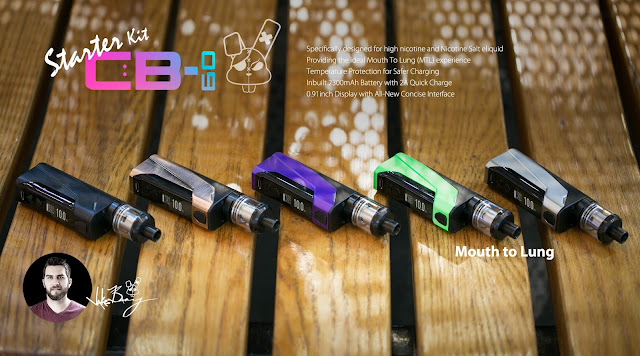 The CB-60 full kit is available in 5 different colors, included Silver, Green, Black, Purple, Bronze. Which color do you prefer? For more information, please click http://www.wismec.org/wismec-cb-60-starter-kit-2300mah-60w-vw-mod-with-2ml-amor-ns-tank.html.